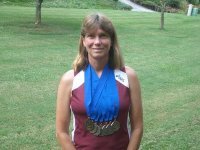 "Here's an update about how your mom did last week in Nashville at the Tennessee Senior Olympics. This year she ran seven races and took home seven gold medals. That gives her thirteen gold medals in two years in thirteen races-- a perfect score! She also set three state senior games records for her age group and came very close to breaking her last year records in the other four races. Congratulations, Karunrun!!!" So as you can see, my mom is pretty awesome. I'm really happy for her and found out she will have articles written about her in the JC Press, the Athens Messenger (hometown Ohio paper), and a write up for her alma mater - Ohio University. Very cool!